Cardiac arrest is a leading cause of death in the United States. Each year, emergency medical services (EMS) treat about 360,000 victims of cardiac arrest before they reach the hospital. Performing CPR (cardiopulmonary resuscitation) and using an AED (automated external defibrillator) before EMS arrives can increase the chance of survival upwards of 70%. Cardiac arrest can happen to anyone at any time. It is important for organizations to implement AED programs so people are prepared to respond to a cardiac arrest emergency. Placing AEDs in key locations, and making sure organization members are trained to use them, can mean the difference between life and death. By learning CPR and learning how to use an AED in the event of a sudden cardiac arrest, one can take action if the need arises. Sudden cardiac arrest (SCA) occurs when a person’s heart stops functioning properly. It can strike anyone, anywhere, anytime. Sudden cardiac arrest is NOT a heart attack. Although a heart attack may cause cardiac arrest and sudden death, the terms don’t mean the same thing. With a heart attack, the blood supply to the heart is slowed or stopped due to a blockage. Cardiac arrest is the abrupt loss of heart function. Cardiac arrest is a failure of the heart’s electrical system. Most cardiac arrests are due to abnormal heart rhythms called arrhythmias. There are four types of arrhythmias that can lead to cardiac arrest: ventricular fibrillation (V-fib or VF), pulseless ventricular tachycardia (V-tach or VT), asystole and pulseless electrical activity (PEA). Ventricular fibrillation, in which the heart’s electrical impulses suddenly become chaotic and ineffective, is the most commonly identified arrhythmia in cardiac arrest patients. When an arrhythmia strikes, blood flow to the brain stops abruptly causing the victim to collapse and quickly lose consciousness. Death can follow unless they receive emergency medical help and a normal heart rhythm is restored within minutes. Time is critical. A victim’s chance of survival decreases by 7 to 10 percent for every minute that passes without defibrillation. Without immediate treatment, the victim will likely suffer brain damage within 3 minutes and will rarely survive past 12 minutes. Commotio cordis is a type of cardiac arrest involving a disruption of the victim’s heart rhythm. Its Latin translation means agitation of the heart. It results from a blunt impact to the chest in the area directly over the heart (the precordial region). Commotio cordis does not result solely from the force of the blow. 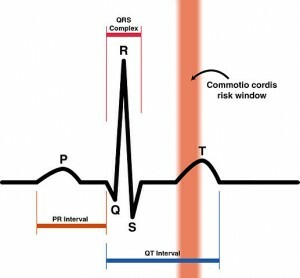 Commotio cordis occurs when the blow occurs at a very specific time during the cycle of a heartbeat; that is, during a narrow window within the repolarization phase of the cardiac cycle, 15 to 30 milliseconds prior to the peak of the T-wave (repolarization of the ventricles). It is a form of ventricular fibrillation (V-Fib or VF). Commotio cordis occurs predominantly in young males. Adolescents are more prone due to the pliability of their chest walls so there is a higher frequency of occurrence for those between the ages of 10 to 18 years, however cases have been documented between the ages of 7 weeks to 51 years old. It usually occurs during sports and is most often caused by a projectile (such as a baseball, hockey puck or lacrosse ball) but can also be caused by the blow of an elbow or other body part. Commotio Cordis – Barry J. Maron, M.D., and N.A. Mark Estes, III, M.D. Some of the sports which have a risk for commotio cordis are baseball, lacrosse, hockey, football, polo, rugby, cricket, softball, fencing, basketball, boxing, karate and other martial arts. Direction of impact over the precordium (precise area, angle of impact) – commotio cordis is a primary arrhythmic event that occurs when the mechanical energy generated by a blow is confined to a small area of the precordium (generally over the left ventricle) and alters the electrical stability of the myocardium, resulting in ventricular fibrillation. Total applied energy (area of impact versus the kinetic energy of the projectile) – in most cases, the patient is struck on the chest by a projectile estimated to be 30-50mph on impact. 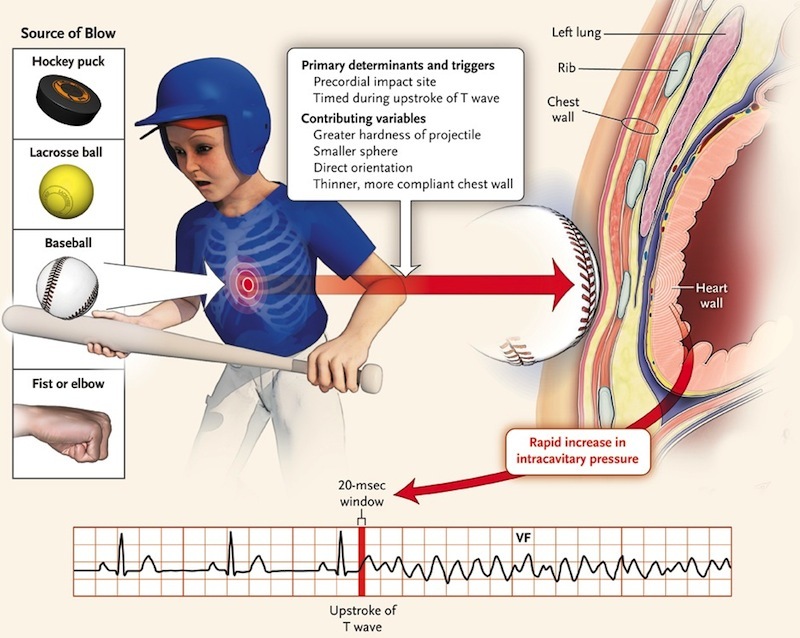 The impact occurs within a specific 10-30 millisecond portion of the cardiac cycle – this period occurs in the ascending phase of the T wave, when the ventricular myocardium is repolarizing, moving from systole to diastole (relaxation). This small window of vulnerability makes commotion cordis a very rare event. This ECG trace shows the portion of a normal sinus rhythm during which commotio cordis is a risk. Considering that the total cardiac cycle has a duration of 1000 milliseconds (based on 60 heartbeats per minute), the probability of a mechanical trauma within the window of vulnerability is 1% to 3%. 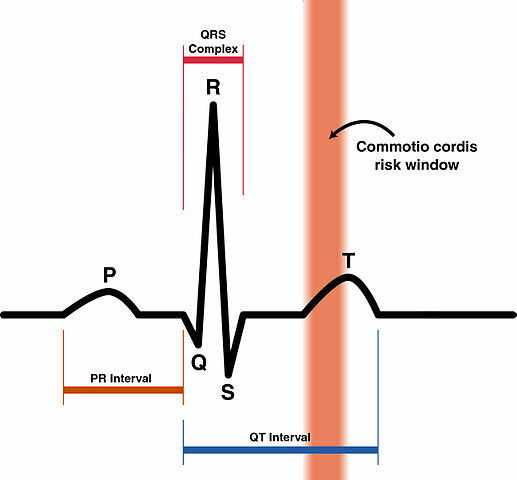 “Commotio Cordis Risk Zone” is licensed under Public Domain via Wikimedia Commons. While survival from commotio cordis has increased, time is a critical factor after the onset of the event. Early cardiopulmonary resuscitation and especially early defibrillation are essential. Having public access to AEDs at sporting events with high incidence of commotio cordis, and training people in the use of AEDs and CPR, can help to further improve the survival rates of people who suffer sudden cardiac arrest. When a person is in cardiac arrest, the only way to correct the electrical rhythm of his or her heart is via defibrillation. Defibrillation is a process in which an electronic device gives an electrical shock to the heart. Defibrillation stops ventricular fibrillation (V-fib or VF) and pulseless ventricular tachycardia (V-tach or VT) and allows the heart to resume its normal rhythm. An AED – Automated External Defibrillator – is a portable, safe and easy-to-use electronic device used to treat victims who experience sudden cardiac arrest (SCA) where the heart unexpectedly and abruptly stops beating. It should only be applied to victims who are unconscious, not breathing normally and show no signs of circulation, such as normal breathing, coughing or movement. When the AED is applied, it will provide audio instructions for the responder. It will then analyze the heart rhythm and advise the operator if a shockable rhythm (either ventricular fibrillation or pulseless ventricular tachycardia) is detected. If a shockable rhythm is detected, the AED will charge to the appropriate energy level and advise the operator to deliver a shock. The electric shock it delivers can correct a heart that is not functioning properly. The AED only delivers a shock if needed. It will not deliver a shock if it detects an asystole or pulseless electrical activity rhythm. The AED will not shock someone unnecessarily. Acting quickly can improve the chances of survival and recovery for victims of cardiac arrest. Performing CPR and using an AED before EMS arrives can increase the chance of survival upwards of 70%. If victim assessment determines that CPR is necessary, do CPR until the AED arrives. CPR provides circulation of oxygen-rich blood to the victim’s heart and brain delaying death of heart muscle and brain death. CPR also makes the heart more likely to respond to defibrillation. CPR cannot restart the heart so an AED should be used as soon as it is available. When used on people who are unresponsive and not breathing, an AED is extremely safe. 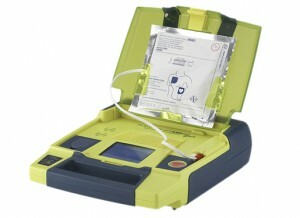 The AED will analyze the heart rhythm and advise the operator if a shockable rhythm is detected. If a shockable rhythm is detected, the AED will charge to the appropriate energy level and advise the operator to deliver a shock. The AED will tell you when to resume CPR. Performing CPR alone has a 5% survival rate, but that rate can reach up to 70% when CPR is coupled with an AED in the first 3 minutes and up to 90% if the AED shock is delivered within 1 minute of the victim’s collapse. More and more AEDs are being installed as state and local legislation mandates them. It’s common to see them in many public places like schools, sports stadiums, shopping malls, restaurants, hotels and airports. AEDs increase the chance of survival in sudden cardiac arrest (SCA) incidents by making this life-saving equipment more readily available for use in an emergency situation. With additional AED programs, more people are empowered to be CPR/AED trained and will be better prepared to save a life. Defibrillation within 3 minutes of sudden cardiac arrest increases the chances of survival to 70%. Shock within 1 minute of collapse raises the survival rate to 90%. The increased availability of AED devices, combined with an increase in people trained to use them, can mean the difference between life and death. Are There Legal Issues When Using an AED? Good Samaritan laws can protect those who use an AED to help a victim. Consult the Good Samaritan Law for your state for more specific information.